E3 Recruitment has claimed the Best B2B Start-Up award in the regional category for Yorkshire and Humber at the Ready For Business Awards 2013. The company will now compete against six other enterprising businesses at the national finals which are being held at the House of Commons in London on 2nd December 2013. 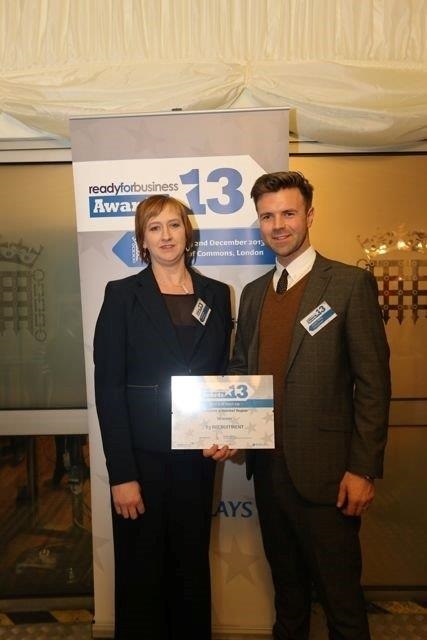 Huddersfield based E3 Recruitment is in line to scoop one of the top prizes in the first ever Ready For Business Awards 2013, the Government supported national investment readiness start-up programme. E3 Recruitment, which was established in May by Tracie Norton and Andrew Pilling, is already one of the UK’s leading blue collar and white collar engineering, manufacturing and technical recruitment specialists. Since opening its doors earlier this year, E3 Recruitment has built up an impressive client and candidate database and has seen its predicted turnover rise more than five times its initial estimate. Andrew Pilling of E3 Recruitment is keen to credit Outsauce, whose financing, back-office and compliant employed solutions helped to drive the agency’s rapid growth from the outset. “Outsauce gives us access to competitive business efficiencies, flexible financial backing and excellent service. Without their support and advice it’s quite possible we wouldn’t have got to where we are today,” adds Pilling. Ready for Business, the investment readiness start-up programme that supports new enterprises across England, has delivered more than 2,500 new jobs nationwide since its launch last summer. The programme aims to create 6,000 businesses with 10,000 new jobs, is supported by the Government’s Regional Growth Fund and Barclays and is delivered by the Cavendish Consortium, a partnership between some of England’s leading enterprise agencies together with the National Enterprise Network.